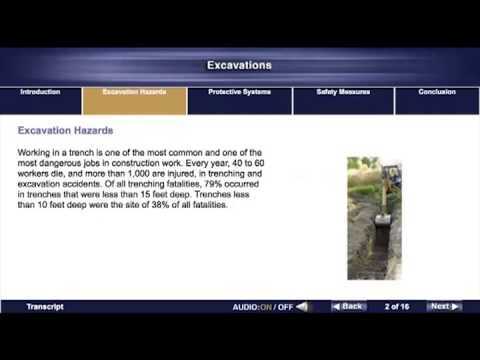 This online Excavation Safety course explains OSHA standards related to safe excavation and trenching operations and discusses the requirements of 29 CFR §1926.21. EXCAVATION SAFETY TEST: Testing conducted throughout this Excavation Safety course is designed to reinforce the information presented. A mark of 80% must be achieved in order to receive a certificate of completion. Participants are able to repeat the course twice if the pass mark is not achieved. EXCAVATION SAFETY ONLINE CERTIFICATE OF COMPLETION: Upon successful completion of this online course, a certificate of completion will be available to download and print.